Thanks for the excellent feedback-it works like a charm! I was totally unaware of why excel was doing this. As far as you know is there anyway you could possibly automate the creation of such a graph….for those really needy end users? When dealing with a number of series, it could get potentially tedious and be error prone. As far as I know, there’s no utility readily available to generate these charts from separate ranges. It would not be a big deal to write something that would combine the ranges and create the chart. To avoid disjointed looking graphs you might replace missing data with #N/A. Excel will interpolate missing data points. True, you could replace all the blanks with #N/A or with the formula =NA(), and Excel will draw lines across the gaps. But I think changing the Tools-Options setting is easier and neater. If you’re dealing with formulas, of course, you must use NA(), because Excel will plot “” as if it is a zero. There is no way in Excel of making a formula return something that is interpreted as a blank cell. 1 more question, if series A is monthly data, i.e. column A only has month input like Jan. Feb,…. Can we still plot in one graph like you did? If your monthly data is to be plotted as markers, you need some kind of day to go with the month. Pick one that makes sense: the first, the last, the 15th. Or you could do a combination line-bar chart, with line on the primary and bar on the secondary (or vice versa), and fudge around with the two axes so the month axis (category or text type) and the day axis (time or date scale) match up as well as possible. I was aiming to do something very similar to what you are doing here, except I wanted the second graph to be a bar chart (I want to show % of things bought while tracking the price over time). Is there any way to get a Bar chart and a Line (line or xy scatter) to plot on 1 time line (x axis)? I presume you mean a column (vertical bar) and a line together? Use the last approach, where three columns include the dates in column 1 and the two series in columns 2 and 3. Start with a line chart or a column chart, then right click the other series, select Change Chart Type from the pop-up menu, and select the type you want. But what if you wanted the chart to be stacked lines, showing a cumulative total of two sets of data being tracked, where the amounts for each line fluctuate on different days, but you want to see the combined sum plotted over time? Is that possible? In order to stack two series, you should have a value at each category (date) for each series. In this case, you can’t keep the blanks in the data. It is probably easiest to sort by date, then interpolate to fill the blanks, either manually or with formulas. I have a similar problem, but in Excel 2003. Another added complication is that I need to plot the two data series on different axes, left and right. Whatever I try, the data does not plot according to the date, but rather plots each data point sequentially. So the monthly data over the same time period takes up only a quarter of the graph taken up by the weekly data. Do you know how to work around this? Have you ensured that you have a Date (Time-Scale) Axis? In the base unit defined as Days? Are your dates numerical or text? It only takes one text value to mess up the whole list. Kindly assist me in plotting a XY Graph with Coulombs on X-axis,on the Y-axis I need Phosphate as primary (on the left hand side) and pH secondary (on the right hand side).I use Office 2007 and sometimes Ofiice 2003 and I did manage to plot the graph of Phosphates Vs Coulombs but I am struggling to add pH on the right hand side of the same graph.Please find the sample of the data that I am trying to plot the graphs for. Clean up the data: use only one row for the column headers. Include units in the same cell, or better, leave them off. Select the “Coulomb” column, then hold CTRL while you select the “pH” and “Phosphate” columns. Create an XY chart. Excel should use the first column as X values and the other two as Y values. Right click the Phosphate series, choose Format, and on the main tab (2007) or on the Axis tab, choose Secondary. Thanks for covering this issue on Two Time Series with Different Dates. I learned from it. One other question. I made a plot with 3 time series. I used one column for the X values (dates) and used a secondary axis for two of the series because the Y-values are different magnitude parameters. 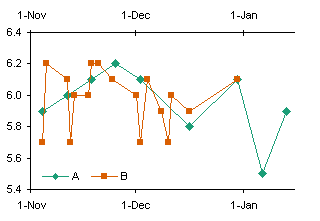 The single column for the dates was possible because eventhough each series had different dates, they all fell in the same months, so I was willing to sacrifice specific dates of the two secondary axis series and use the date from the primary axis data series (made the assumption that the secondary axis dates were close enough to the pirmary axis series). I have a decent looking plot, but the seondary axies series sets show a point no. instead of a date when I select a point on the graph. The primary axis series shows both the value and the date. Any suggestions to make the dates also show on the two secondary axis series points? You didn’t mention a version of Excel, but Excel 2003 automagically applies the primary category labels to the secondary axis. (If it doesn’t for some reason, go to Chart menu > Source Data > Series tab, copy the address from Category (X) Axis Labels to Secondary Category (X) Axis Labels). 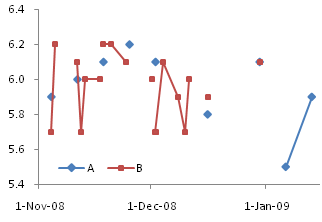 In my little test Excel 2007 also applied the primary labels to the secondary axis. But the protocol to fix your issue is to right click on the chart and choose Select Data. Select a primary axis series, and click on the Edit button under Horizontal (Category) Axis Labels, copy the axis label range address, then select a secondary axis series, click again on the Edit button under Horizontal (Category) Axis Labels, click in the box, and paste the address. very nice comments and solutions you have here. Perhaps you can help me. I am strugling with excel 2007 to plot lines with date axis. It looks like excel 2007 is acting unlogical. I’ll decribe the problem using a simple example. Let’s make two lines: series1 (column B) and series2 (column C). Have a common date axis on column A. Have the dates running from for example 8-nov-2009 till 22-dec-2009. First plot series1 as a line (with markers). 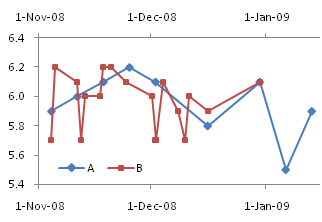 Date axis will be from 8-nov-2009 till 22-dec-2009. After that add series2. So far so good. Since I like to start the date axis at the first of month I am fixing start x-axis at 1-nov-2009. This is also still fine. The first point of line is positioned above x-axis location 8-nov. But now comes the annoyance. If I want for series2 to correspond to a secondary axis excel messes up the x-axis placing the lines with respect to the x-axis. Just realized that somehow excel 2007 makes the secondary x-axis prevailing and I must manually configure secondary x-axis to have the lines displayed correctly. This means that I when secondy axis switched on I am switching on as well secondary x-axis even if I am not displaying.?? Is there a way to link secondary x-axis to primary x-axis (automatically matching ranges)? Is there a more efficient (other) way to plot the chart that I just described? ps: By the way I tried as well with combination plot (changing series2 to xy-plot) but di’n’t manage. Scroll down to the heading “But there’s an easier way.” This technique only needs one X axis, and only requires a slight realignment of your data. Have tried contents of heading “But there’s an easier way”, but that does not work. (Maybe I am doing something awfully wrong). Introducing the secondary axis makes the placement of the lines wrong on the primary axis when you are fixing the start point (in my case first of a month). I can only get around by matching the range of the secondary horizontal axis with the primary horizontal. Have not been able to find a different way. Thanks! This has been very helpful. I sure wish I had known about this blog years ago. Hi – this works great for dates (the combined data ‘easy’ method), but my data all occurs on the same date, at different times. So I have 2 series all happening over the period of one hour. Series one contains data every second, series 2 data every 30 seconds. I really cant seem to get Excel 2007 to plot them on the same time line. A date-scale axis considers only integers, so it plots all points for a given date at the horizontal position for that date. You need to use an XY chart. The problem solved in this article, aligning multiple sets of X values, occurs only for line charts, not for XY charts. Congratulations on a most informative blog. I have learned a lot just from reading it, but unfortunately I have a different problem. I have a graph similar to the one you show just above your heading “But there’s an easier way.” It plots two time series where the time marks do not coincide. What I would like to do is plot the sum of the two curves created by joining the respective dots. Can you please tell me how I might go about doing this? Assume that there is a start dot and finish dot on the same time mark for each curve. Thank you in advance for any ideas you may have as to how to go about solving this nasty problem. If you do not have points at the same X values, then summing them is quite a tricky exercise. You will need to decide which X values you want (series A, series B, both sets, or an arbitrary set that covers the range). Then you need to interpolate your values for the two series so you have Y values at this selected set of X values. Finally, add the Y values together at each X value. Yes, I realise that some interpolation would be involved. However, Excel manages to do this internally in order to join the dots and plot a curve for each data set. I was wondering if it is possible to get access to the data used by Excel to draw each plot? If each plot had the same number of data points, it would then be a simple matter to sum the curves. You mean the lines Excel draws? Hardly interpolated, they are just straight lines. If you use smoothed lines, you may be fooling yourself. There is nothing in the data that indicates the direction the smoothing should go, unless you have a physical model you are fitting points to. In the absence of such a model, it is dishonest to use anything other than straight lines. Well, the actual problem is to sum two plots of a function, the function being so complex as to be way beyond what Excel can do. In fact, the function is generated by solving a set of very complex set of equations, known as Lommel functions. I use Mathematica to do this, that is to generate the data for the individual plots. 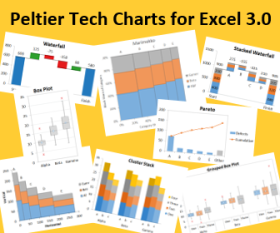 I simply want to use Excel for its plotting and display capabilities, because it looks great and is easy to use. As a simpler example, consider a situation where I might want to sum two sine curves and plot the result. Each sine curve is the same amplitude, but they differ slightly in frequency. I only have one set of data points to define the sine curve, but I can have as many points as I like. So the curves can be well approximated by a set of straight lines if I have lots of data points. The problem is, two sets of such points for two curves never quite line up. So I thought that if I could use Excel’s interpolation and simply add two curves, it would save a whole lot of mucking around. I hope this explains the problem a little better. 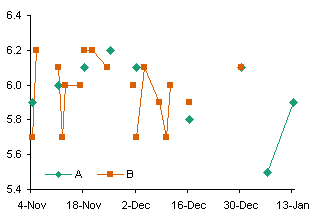 I guess my real question is – is it possible to get access the the raw data for the lines which Excel actually plots? You’re providing the raw data to Excel. All you need to do is apply your own interpolation function in another column (or other columns) of the worksheet, and sum the values. Y is the interpolated value at X, while X1,Y1 and X2,Y2 are coordinates of the known points on either side of the interpolated point. Yes, I am familiar with what you are suggesting, and I will give it a try. Hi. I need a little bit of help with a presentation. I have to plot on a graph the temperature and the pulse of a patient (in Power point). i need t put this two sets of data, but the data range for x axis is different (35.5 – 41 vs 50 – 150). It is important to show that the two lines diverge at a point . How can this be done? Thanks! One more thing, I need to make a concordance – 60 pulse with 36 fever, 70 with 37 etc. This is important. Do you have a correlation between the 35.5-41 scale and the 50-150 scale? You need this for the lines to be horizontally aligned. You also have to be careful with two different vertical scales. If you want to show divergence from the initial point, you should normalize the two variables so they equal 100 at this point, and deviate from that. Depending on the relative scales, data plotted on two different axes can be made to converge or diverge, cross at any point, or stay far apart. yes, I have a correlation: 36 – 60, 37 – 80, 37 – 100 etc (for every degree a 20 beats/minute increase in pulse). All you have to do is set the axis scale of the two axes so the min and max on one correspond to the min and max on the other. Has been this topic (i.e. printing multiple data-time series in one graph) better resolved in Excel 2010? I know that it is perfectly resolved in a program called Origin. This behavior is the same in Excel 2010 as in 2007. Very few changes have been made to charting in Excel 2010, other than making it less time-consuming when charts are redrawn. I have statistical data that I want to analyze. Actually, I do not have any background on statistics, I want to make Unit root test analysis with Excel 2010. The data has 2 explanatory variables related to year. Man Pull – You’ll have to do your own Google search, since I have no experience with these methods. Reading this was some of the most well spent time I’ve had in a while. I’m very comfortable with Excel, but I learned a ton of things today in a beautifully presented piece. Thanks for sharing. 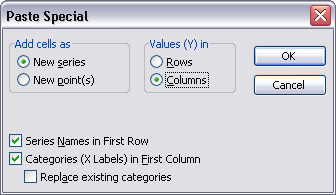 Within Excel 2003 there was the facility to set the “X” axis range independent of the primary and secondary series data sets. 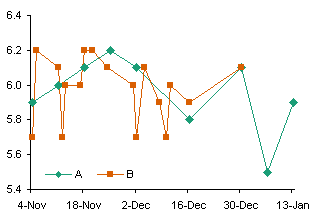 Plotting two different, but related, time series onto a common “X” range was then relatively simple. Having converted to Excel 2010 it is proving impossible to do this as, as soon as a secondary series is defined, Excel substitutes the “X” data set of one series with that of the primary, forcing both sets of “Y” values onto one set of “X” values. Having exhausted both the general advice and tried your solutions above, none of which work, there appears to be no clear facility to do this in 2010. I can’t believe this is the case, but what is the solution? Are your series plotted as Line series, or as XY series? In either case, the behavior is the same in all versions of Excel. The different appearance of the dialogs and menus/ribbons may mean you’re following a different set of procedures, even though it seems the same as before. A Line Chart uses the same X values for all primary line series, and the same X values for all secondary line series; the primary and secondary X values need not be the same. This behavior has not changed since Excel 97 or perhaps earlier. Remember also that any numbers are treated as non-numeric text labels on a line chart’s axis. If your series were specified using different X values (by copy and paste special, or by editing the series formulas), even though they’re on the same axis, all Excel versions remember these different X values for each series. If you define or redefine the X values for one of the series on a given axis, all Excel versions assign these redefined X values to all series on the affected axis. No series on the other axis are affected. If you subsequently redefine a series’ X values by editing the series formula, Excel will again keep the X values of each series separate, even though it still uses just the first series’ X values in the chart. Line series originally. I’ve now changed the chart type to XY but….can no longer use a clear date reference for the axis scaling (although it will still display a set of dates). So I have to frigg around with the scale numbers until I get dates that roughly correspond to the ones I want (end of month, they vary by about two or three days). It’s a right pain and looks really untidy. I never had this problem with 2003. 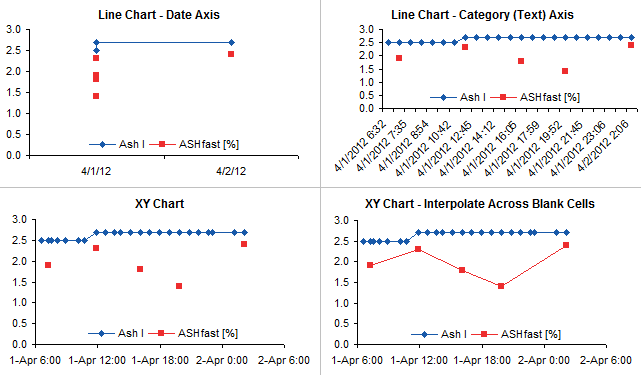 Very easy to produce good axis scales and ranges independent of the XY series data. There looks to be a residual capability to set the X axis…but it doesn’t appear to work once the series have been specified. I put your email into another comment, just to keep the discussion in one place. Excel 2007 screwed up Line-XY combination charts, which seems to be the problem you’re having. Find “But there’s an easier way” in this post, and set up your data following that example. 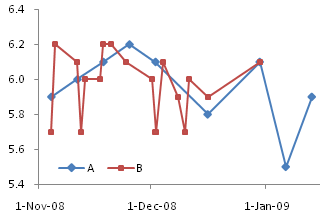 Make a line chart, and make sure to set plotting of blank cells to interpolating a line across the gap. I am trying to plot multiple series in a line chart with the timescale x-axis, and of course each series has a unique set of dates associated with the data points. I got excited when I found this post, and especially “But there’s an easier way.” However, I am trying this method of offset series columns in Excel 2010 and I’m noticing that Excel is not sorting the dates automatically. Instead, it is choosing the date range adjacent to one of the series and plotting both series on that range. This of course is exactly what I’m trying not to do. When I try to do this with more than two series (I have 10), Excel chooses the first date from the range adjacent to each series and makes a multi-level category line chart. Do you know if this method works in Excel 2010 at all? Am I just doing it wrong? This works the same in Excel 2000 through 2010. Your data range may not be properly set up. Look at the example range in the article above. Are all the dates in the first column (column G)? Do all columns with Y values have a series name in the first cell (H1, I1)? Is the cell above the dates blank (G1)? Have you selected the entire range to make your line chart (G1:I27)? I was able to get it to work. I didn’t have the cell above the date range blank, and after selecting the entire range to make my chart I had to tweak the series and horizontal axis selections that Excel automatically made, because the first three columns in my table were being used as the horizontal axis values. Making sure that my series values, which were imported from Microsoft Access, were in number format was another important adjustment I originally overlooked. im using two seperate data loggers and trying to combine both sets of data on one chart. would like to combine both sets of data on one graph but am closer to jumping off the roof from battling excel. is there anyway to sort this please. If your data comes in more frequently than daily, you can’t use a line chart. Us an XY chart. You still should try to use fully qualified times for your X values, that is, values with both date and time. Then you can make your chart with one set of data, then copy the other set of data (X and Y values) and use Paste Special to add this as new series, categories (X values) in first column. Is there a routine in Excel that allows one to fill in an interpolated value of a time series using the times from a different series? I would like to use the interpolated values in the first set, that are derived from measurements made at coarser intervals, to correct the measurements in set two made at more frequent intervals. The task is to make the two datasets line up with values occurring at all of the more frequent intervals. Excel doesn’t do that automatically. But you could easily use a set of formulas that did a lookup and interpolated to find specific values. I have struggled with data like this. Some values came for some samples only. How can I get them in same chart? I’m using now Excel 10. Your data is not suitable for a line chart. 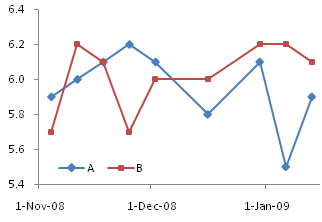 An Excel line chart will see dates and times and assume you need a date-scale X axis. Unfortunately the resolution of this axis is by day, so all your data for the first day is plotted at the same X position centered over the first day, and all the data for the second day is plotted centered over the second day (see chart at top left, below). You can change the axis to a category/text type, which equally spaces all of the data without consideration of the numerical values of the dates and times (top right). If you make a line chart, the data is appropriately spaced according to actual times, some closer than others (bottom left). 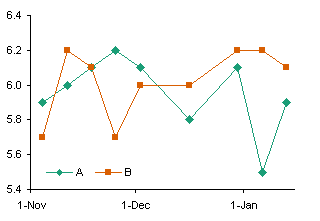 The markers in the second series are not connected by lines because of the blank cells in the data. Change this by instructing Excel to interpolate across gaps in the data (bottom right). Thanks for your guidance above, but alas my problem is somewhat different with the need to show two variables of different metrics (so I use the secondary Y axis) and be able to shift one relative to the other in time. I appreciate this is confusing, as the date ranges will be the same, but I wish to explore how, when one variable offset relative to the other, they visually relate. Is this possible in Excel 2010? And, if so, how please? What a wonderful explanation, after 10 minutes on google i found your page and thought that i found the answer of for my problem: to get results of different fieldwork measurements overtime in one graph. I tried to do the trick you used to get data with different monthly values in 1 chart. Unfortunately it didn’t work out as expected(the data is put behind one another in the chart). I think that the problem is that I have to many series but i am not totally sure! Could you please look at my spreadsheet in the link attached? In the first one is the raw data, in the second I tried your trick! If you could please see in a second what I did wrong I would be very grateful. The first link is a screenshot of what i did, since i got more than 800 cases i also added the xls file because the screenshot does not give enough insight i think. In the last link i added a graph of what i want but than for the whole time series instead of only 2007. I am trying to do the option where you cut and paste the series 2 data under series 1 in Excel 2010. I cant figure how to make them overlap, as of right now they are simply plotting one series after the other. Are there other trouble shooting tips you can give? 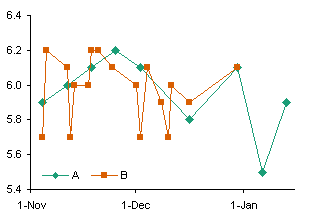 So I am guessing it isn’t working for me because my time value has been written in the format “2y, 222d”… There is too much data from too many sources for me to change each cell individually, is there a way or a formula to convert this to a numerical value that would still allow me to represent the plots according to age. (one axis is the age ranging from 0y to 7y 364d; and the other axis is weight in kilograms)… thanks for any help you can give! Excel treats those “dates” as nonnumerical labels, and puts each one into the next slot along the X axis. I think you can just make an XY chart, since these aren’t really dates, but ages, that is, durations between two dates. Its a long series with more than 10000 rows.I am using 2007.I want data in the following format. The times are clubbed like 15:01-15:59 is clubbed as 15:00 etc. Is there anyway to do it?I would be very gratefull if you could give me a solution urgently. 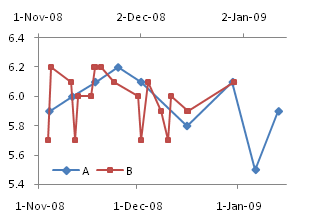 A line chart used as a time series cannot distinguish units finer than days. You need to use an XY chart if you have times which are significant. The series in the XY chart can be formatted in the same way as a series in a line chart. DUDE GREAT POST – VERY HELPFUL!! The comment about #N/A also very helpful!! Will this work for a data series over 10 years? I am only interested in the day of the year, and have individual years set as series. I am trying to combine 2 density tables in excel but the X-axis is numerical, not date. Could you advise me how to combine the density plots when the X-values are different but overlapping? I tryed to use a line plot or a XY plot but I can’t get the density plots on the same range, instead I get both plots with the x-axis range of the same series. You want an XY chart, so there is no need for the gymnastics required for line chart dates. Create the XY chart with the first set of data. Copy the second set, select the chart, and use paste special to add the data as a new series, with categories (X values) in the first column. 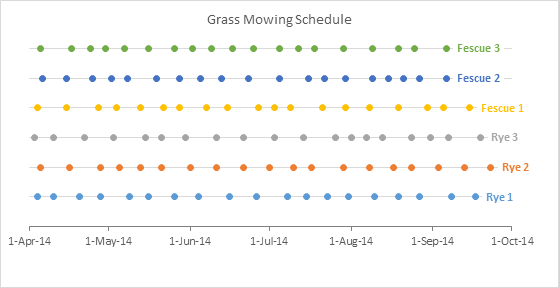 I have 3 ryegrass and 3 fescue pastures treatment with different cutting dates for each treatments during the trial period of 2 years. I need to draw a graph of 6 treatments with exact dates going along with each treatments. This is way difficult to draw this graph. Could you please help me and I am using excel 2010. I imagine your data looks something like this. I’ve used 1, 2, 3 for the Y values of each treatment, so when I plot them, each lies along its own horizontal line in the chart. 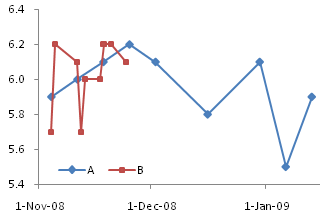 Create a line chart, format the series with markers and no lines, label the last point of each series, etc. I have a similar problem, not for plotting but for data preparation. I have two time-series data of securities A and securities B. A trades on a certain days that might overlap with B. What I have to do is to write a formula (not using sort, filter or other functions) to combine all the days of A and B. But these instructions are outdated. In Excel 2013 and 2016, you nowh have to: Right click on the chart, select ‘Select Data Source’, select ‘Hidden and Empty Cells’, then check ‘Connect data points with line’. Yes, that’s in the section on Excel 2007, right above the last charts in the article. Maybe I should call the section “Excel 2007 and Later”. This was helpfull. Thanks very much. further, after plotting the data series, I want to show a line graph for sum of all the columns. For instance, say I have 3 parameters(A, B, C) in different proportions, changing every day. But the sum is equal (D=A+B+C). How do I show D? The sample collection of the 3 individual components A, B, C are at different time intervals (say A was collected every 24hr, B-every 10 hr and C-every 15 hr). How do you define A+B+C for an interval which only has a value for one or two of the addends?